Bright red painted wood and rush chairs flank wood tables accessorized with black napkins, and square wooden boxes which hold the menu and act as charger plates, walls of windows afford views of the water and the Royal Palace, and the open kitchen provides an interesting look at the chefs at work. The well-stocked horseshoe bar has tall stools in the center of the room, tall bistro tables with stools line one wall, and high backed white spindle chairs flank a larger table by the window. 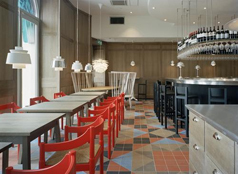 Contemporary lights are suspended over the tables, and there is a colorful geometric floor with sky blue, black, mushroom, taupe and terra cotta tiles. The restaurant opened in May 2007, and Edward F. Nesta and I had lunch there during a visit to Stockholm in May 2008. The feel of the restaurant is much like a tapas bar where each course is ordered one at a time, and cooked to order, from the menu sections with playful names of From Our Country, From Other Countries, From the Plant World, From the Pantry, and Dairy Products and Cold Cuts. The menu changes daily offering guests the opportunity to enjoy the best of the season. While waiting for our first courses, we opened our little brown paper surprise bags and found krisp bread, which we happily munched on. Edward began with a selection of Soup of Morels from Turkey with poached egg, and green asparagus (Soppa på toppmurklor frǻ Turkiet lantägg 63°C, grön sparris) From the Plant World section, which was presented at the table with the server pouring the broth around the egg, morels, and asparagus. The poached egg added an interesting layer as it mixed with the rich, hearty, and earthy soup. Thickly sliced fresh crusty bread spread with fresh butter that was arranged on black slate, accompanied this tasty first course. As nettles were in season, I selected the Croquettes of nettles from Kälinge farm served with a half lemon (Kroquetter på nässlor från Kälinge gård severas med en ½ citron) also From the Plant World, which were crisp, round balls of perfection. Biting into the crisp exterior, I was rewarded with a creamy blend of nettles that was enhanced with a slight dusting of sea salt. For his second course, Edward selected From Other Countries, which was fresh white asparagus from Rhineland-pfalz rilette of crab, egg, and parsley (Inkokt vit sparris från Rhineland pfalz krabbrilette, ågg, persilja). Having a great view of the kitchen, we watched the chef building this delicious course, presented as large white asparagus forming a box with crab in the middle topped with mixed greens. I selected the breaded filet of lemon sole from Kattegatt, celeriac, avruga caviar and dill (Bröstekt rödtunga från Kattegatt rotsellerikräm, avrugakaviar, dill), presented as two delectable rectangles of golden sole with a lovely line of black caviar marching down the center of the fish, on a bed of piped celeriac cream, From Our Country, which was an elegant dish that was perfect for a light lunch. The desserts were too inviting to bypass, and since it was the start of the rhubarb season, we indulged in the fried raw rhubarb from Holland, lemon sponge cake, quenelle of vanilla ice cream and browned sugar (Rästekta rabarber från Limburg, citronkaka, vaniljglass, brynt smör). It was a most delicious end to a wonderful lunch. Matbaren is open for lunch Monday - Friday from noon until 2:00 pm, and for dinner, Monday - Saturday between 6:00 pm and midnight. Read other articles on the Grand Hotel Stockholm in the Destinations, Hotels and Resorts and Chefs' Recipes sections where Chef Mathias Dahlgren shares tempting recipes for a three-course menu in English and Swedish. 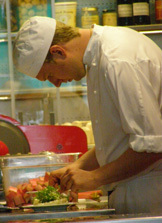 Read other articles on Sweden in the Destinations, Hotels and Resorts, Chefs' Recipes, Gastronomy sections.